Spruce is the perfect tool to help you showcase your business or nonprofit organization. Create a beautiful, private iPad app to display in your lobby, to a client, at a convention or at a fundraiser. Designed for anyone to use, you don’t need any design or programming experience to make an app with Spruce. Make a product catalog, a member directory, an event schedule, a learning module, an interactive profile and more. All it takes is a little creativity. 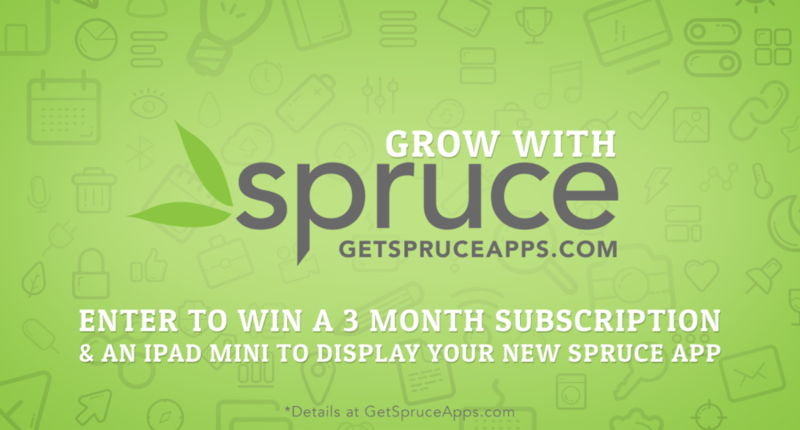 Spruce and developer MotionMobs believe so strongly in Spruce’s capabilities that we are giving away a free three-month subscription to Spruce and an iPad mini to use for displaying the app to an organization or business that has the most creative use for Spruce. What you would like your app to do, keeping in mind the Spruce sections: text, single photo, photo gallery, video, PDF, email form and table-based directory. You can even build your Spruce app for free with the 14-day trial period and show us your idea through screenshots. Be sure to include your name, business or nonprofit, email address, phone number and website. Know of a deserving company or organization? Nominate them by submitting their name, organization, email and why they are a good fit, and we will send them instructions to apply. Email us with your idea by Wednesday, October 29 at 11:59 p.m. Winner will be announced on November 5. Terms and Conditions: No purchase necessary. Entries must be for a registered business or nonprofit organization. Individuals are not eligible to win. Nominated businesses and organizations will be contacted by Spruce or MotionMobs with instructions to apply. iPad mini with Retina Display will be 16 GB, wifi only, silver model. Winner will keep iPad mini after promotional subscription ends. Winner chosen at the discretion of Spruce and MotionMobs. Employees and immediate family members of Spruce and MotionMobs’ employees are ineligible to enter.